Chicken, Cod, Plaice, Lamb Growing kittens need nutritional care from the very beginning and specifically formulated food to meet their every need. 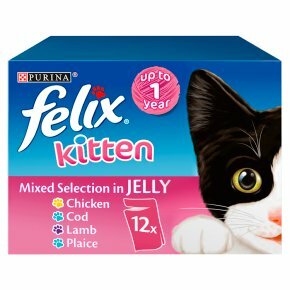 Our FELIX® Kitten Mixed Selection Pack in Jelly is a great assortment of delicious flavours, packed with essential nutrients. Purina experts and nutritionists have developed our recipes to make sure your kitten has the best start in life, beginning with their diet. We include proteins, minerals and vitamins that promote growth and support the development of healthy teeth, muscles and bones in your kitten.